Every boss has his own individual manner of ensuring that every employee in the company does his work in a proper and effective manner. Some bosses prefer to leave all employees to their own devices and they even permit them to make their own share of mistakes. They believe that everyone functions in their own way and interfering unnecessarily will cause them to react in a negative manner. Yet there are some bosses who make it their business to micromanage, without leaving anyone to do things their own way as they believe that the way they use has too many risks attached. 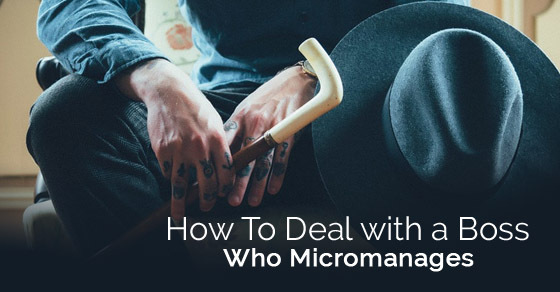 Here are some ways to deal with a boss who micromanages. Micromanagement is a managerial style which many bosses employ. They believe that functioning in this manner is going to yield the most favorable results and if they leave employees to do whatever they want to do and take decisions according to what they think is correct then things might begin to get out of hand and peoples’ personal agendas might start taking primary position. This management style does yield some positive results as it constantly keeps the employees on their toes where they realize that they cannot do whatever they want. Functioning in this manner has its positive as well as negative side. It might bring out the best in the employees, yet at the same time it might even bring out the worst in them causing them to absolutely test you in every way. However most often this term has a negative connotation attached to it. Constantly poking after people and questioning them at every turn might cause them to feel like they are back at school rather than working in a professional environment. A boss must make it a point to note the kind of people he is working with and adjust his management style accordingly. As per business management a boss who micromanages likes to know exactly what each employee is up to and makes it his business to ensure that no one is wasting any time or wasting company money in doing things which are too risky and even unnecessary. He is a keen observer and nothing gets passed him without being detected. From the managers down to the clerk, everyone is answerable to him and can be pulled up at any point of time for unauthorized work which has been carried out using the company resources. This boss is a no nonsense person who can be thought of as rather authoritative. There are some bosses who believe that once they have selected efficient and able managers then they can leave some responsibility to them without having to take on any additional burden of dealing with the subordinates. A boss who micromanages, might undermine the authority of the manager where he makes it a point to not delegate too much power to the managers and even goes so far as to cross check them and tell them to change decisions which they have made or orders which they have given. In such a way managers are also kept on a short leash and can’t function in their own way. Since a boss is at the helm of things and owns the company himself, he knows that it is his responsibility to drive the company to either success or failure in such a case he prefers to take control of everything himself rather than having to trust anyone else and be let down when things go wrong. In this way if problems and issues come his way then he knows that the only one to blame is himself. First and foremost when trying your level best to survive with a boss who micromanages, you should look inwards and see whether your boss only micro manages with you or he does it with everyone else in the company. If he does so with only you, then you should realize that maybe there is something wrong in the manner in which you are functioning. Yet if your realize that he is like this with everyone at the company then you have nothing to be worried about, he just has the best interests of the company at heart and you might learn from his manner of carrying out work. Bosses are people too, who have so much on their mind. Without any cause or reason they have no interest in getting after you. They derive no pleasure in making your life a living hell and constantly pulling you up. So what you can do is take note of your bosses behavior and see whether he only acts in this manner when he is under a lot of pressure.. If such is the case then you can cut your boss some slack and just indulge him because he knows that if anything goes wrong, then it is his reputation that goes down. Chances are that a boss who is new at the job will micromanage at the initial phase, so just give him time to settle down and when he realizes that everyone in the company knows their individual role to play and they always act in a professional manner then he will settle down and he will start giving people space to grow and explore on their own. When his trust increases and he recognizes those who work well and perfectly on their own, then he will seize to breath down anyone’s throat. Just bear with him or her for a few days and then things will gradually get back to normal, over time. Bosses are skilled professionals who are at the top of their games because they know exactly what they are doing and they are very experienced individuals. So rather than feeling bad, you can have faith in the methods and style which your boss has employed and learn a thing or two from him. If his method yields positive results in the long run then you can tell that he is someone who has a distinct plan of action and knows what he wants to do. When you become a boss maybe even you can follow in his footsteps to yield rich dividends. As an employee under a boss who micromanages one of the worst things you can do is challenge his authority and disregard whatever he is telling you. Doing something like this is bound to get you on his wrong side. Even worse is that you might even get yourself fired! Bosses who micromanage, dislike those who challenge the authority and cause disruption within the office. These bosses like this to function in a smooth manner following all the protocol. Bosses like this do not believe in fate they rather follow instructions and procedure to perfection. One of the best tips to deal with a boss who micromanages is to constantly keep your boss up to date with whatever project you are working on and constantly welcoming questions from him. Rather than him having to come up to you asking what you are up to, just constantly keep him posted yourself. Doing this is really going to impress him as it is one less person who he will have to chase after to find out what is going on. If possible every week you can submit a file stating the project you are working on, the progress you have made and the things which you have planned to do in the following week. If you are someone, who gives up bad work every time then that is only going to encourage your boss to keep an eye on you all the more. On the contrary if you constantly give up top quality work and strive for perfection at all costs then your boss will learn to trust you overtime as he will realize that you are someone who has your own ideals and that you are responsible on your own, without having to be told what you ought to do at all times. He will appreciate a conscientious worker like you who works honestly and diligently. Rather than trying to hide whatever you are doing so that your boss does not come asking you a number of questions, it is advisable that you constantly keep your style of working rather methodical and transparent. Show that you are a good choice when it comes to carrying out any responsibility which has been given to you. Working in this manner is not merely going to impress your boss but it is also going to bring out the best in you and train you to work in a professional and efficient manner. You will learn to make every second count and not waste time on things which are not important at all. Another tip to help you work under a boss who is a micromanager is seek advice from him when you are in doubt about what you need to do. Doing this is going to make him feel very good and it will communicate to him that you are someone who never shies away from asking questions when in doubt rather than making mistakes because you were too proud, yet this having been stated, ensure that you do not go running to him for any and every little thing as that is just going to get on his nerves and tell him that you are someone who has no self confidence at all. No company wants employees like that. This is something which is rather subtle. If you notice that your boss who micromanages is too much of a pain, then you can keep him busy with a query of yours. While keeping him busy with a tough question which you genuinely have, you are free to work on your own without constantly having someone who is keeping a close eye on you. Finally never show signs of irritation when being asked things by a boss who micromanages as it might communicate to him that you have something to hide and that you are up to something underhand. These are some of the ways in which you can deal with a boss who micromanages. If your boss is someone who micromanges, you should try and have a positive outlook to his behavior as that is just the manner in which he functions. Do not take it to mean that he does not trust you, just accept that he likes to have a hands on approach and likes to avoid complications and mistakes from beforehand if possible. There are some people who like working under a boss who micromanages as they feel like they can constantly approach such a boss, yet there are some people who find working in such an environment impossible and repulsive.